Dark, dingy, and crumbling no longer—these renovated modern homes are works of art. From a warehouse conversion to a midcentury home's much-needed update, here are the projects from the Dwell community that caught our editor's eye this week. Mas-aqui renovated a crumbling warehouse with floor-to-ceiling windows that bring in warmth and light. The dining room has a view across the new patio toward the atelier. From the architect: "The 250 square meters of the warehouse had not been updated in 60 years: [the property] was run down, dark, and divided. The renovation has extended the life of this former warehouse, converting it into a home full of natural light that enters through the newly created apertures. It is a harmonious combination of Japanese and Catalan style that is simultaneously functional and elegant." Custom walnut built-ins offer storage and reduce the need for furniture in the Tamalpais Street Residence. 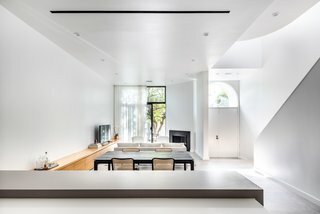 Ogawa Fisher Architects removed a large central room divider to create a bright, open space. 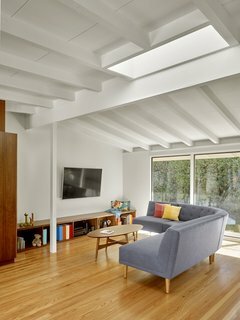 From the architect: "The owners loved their midcentury post-and-beam home, but the spaces were feeling a little tight—especially with a baby on the way. To make the home feel bigger without enlarging the footprint, we removed the large central room divider to create a bright, open space. Next, we shifted the kitchen—with its crisp, white cabinets, colorful mosaic tiles, and walnut accents—to one side. Islands on wheels offer multiple layout possibilities, while custom walnut built-ins offer hidden storage and reduce the need for furniture. Full-height glazing on both sizes of this space open onto large, level decks, creating a strong indoor-outdoor connection and providing plenty of natural light.A crisp, modern palette complements the midcentury exterior and extends into the bright and airy bathroom, where decorative cement floor tiles serve as the focal point." The Throckmorton Renovation can be likened to a small art gallery. Official Design honored the history of the Bud Oglesby-designed home by adding a plentitude of natural light and celebrating the formal geometry of the original design. From the architect: "Our aesthetically astute clients bought a 1980s Bud Oglesby-designed townhouse with the intention of renovating it for themselves and their growing art collection while staying true to the original design. The project had a sophisticated section, so our goal was to modernize the spaces in both use and technology while also rectifying awkward and outdated spatial relationships. In the original layout, the utilitarian spaces were on full view from the front door. Our intent was to create a more formal entry sequence and conceal the laundry, garage, and utility rooms. To do so, we opened up the enclosed kitchen and reorganized the support spaces behind a complementary curved wall that ties back into Oglesby’s original sculptural stair and landing." The exterior terrace, water channel, deck, and window wall of Matt and Jon Andersen-Miller's renovated midcentury home. 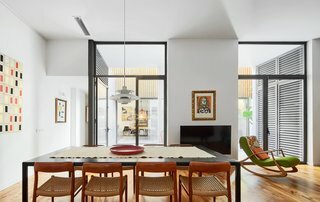 From the architect: "When Matt and Jon look back at the before photos of the home they share with their young son, they ask themselves what in the world they were thinking when they bought it. The 1962 post-and-beam home was in a state of extreme deterioration and was marketed as a tear-down. 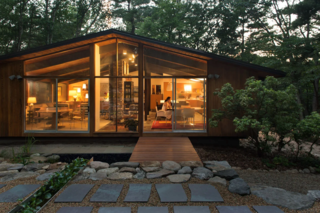 The house—part of a subdivision in Concord, Massachusetts created in the late 1950s by the Deck House Company of nearby Acton—reminded them of the Eichler homes they knew from the West Coast. The pair could see, under layers of dust, mold and debris, the gem that was waiting to be restored. They saw the importance of bringing it back to life, both for its contribution to the little neighborhood of similar houses and for the environmental value of saving its materials from destruction. After six months of renovation, carried out with an approach borrowed from their experiences of restoring much older homes in historic districts around the country, they moved in and became the second family in its history to call it their home." The renovated kitchen of Louise Avenue features a deep sink and a coat of pastel-pink paint. Homeowners Chris and Claudia Beiler lovingly restored the home after purchasing it in 2018. From the homeowners: "We are passionate about community and our local area being revitalized. 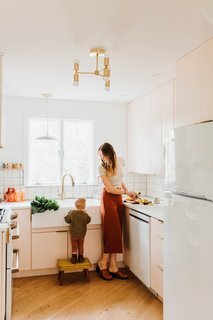 We started renovating homes in our spare time to fill a void in our area with creative housing—we loved it so much that we knew we had to quit our jobs and do it full time. We purchased this home on foreclosure auction in August of 2018. The house had been severely neglected by its previous owners, and from the very first walk thru we couldn't wait to breath new life into her. She was built in the 1940s and still had a few original aspects to her—of which we were bent on keeping."